Here is an FLV flash player in a very simple form. No install required just use as is. To get the movies to play just type in the number of the video and press enter. If you click on the image you will get the player in fullscreen. 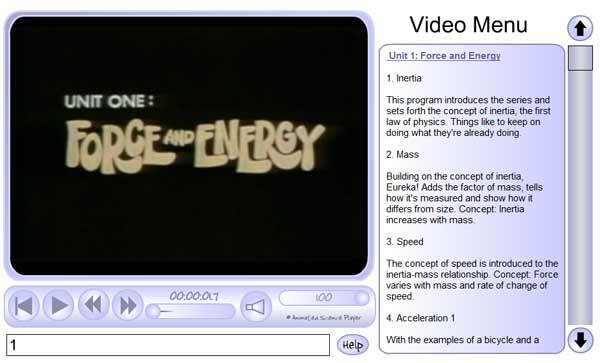 This set of videos are out of print but original copyrights to KOCE have been preserved as a set to show how Physics used to be explained to Y7 -> 13 and still should be! Also you will need a password and user to access this area just use “eureka” for both! You can do this yourself and make your own libraries. However, you must do a couple of things first to make it work correctly…. 5) Edit the file “menu.txt” to describe your movie. There is help in the zip file on which tags you can use. Check out the simple example to see what you must use at the top and bottom for it to load properly. 7) Download SwishMax and edit my player for your own uses! Copyright Notice: I am happy for these materials to be used by anyone who is not directly making a profit out of my player. Please check out http://www.buraks.com/flvmdi/ for the Meta Tool rights.